It is imperative that we train leaders who are able to intervene efficiently with service users and to support a better organization of the workplace. It is especially important to look at the many issues related to postsecondary training and human resources, such as recruiting and keeping these leading professionals. 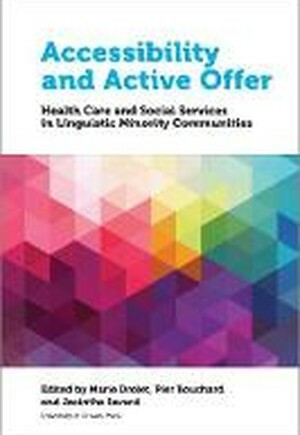 Accessibility and Active Offer thus combines theory and empirical data to help future professionals understand the workplace issues of accessibility and active offer of minority-language services. This English-language adaptation of Accessibilite et offre active features an additional chapter by Richard Bourhis on issues specific to Anglophone communities in Quebec. This multidisciplinary collective work is the first to unite researchers in health, social work, sociology, political science, public administration, law and education, in order to gain more thorough knowledge of linguistic issues in health and social services, as well as of active offer of French-language services.